Fashion design takes on a whole new dimension. Another season means another super-stylish Klutz book strutting down the runway Ñ but this time thereÕs a brand-new wrinkle. Well, technically, itÕs a fold. A whole bunch of beautiful folds. Introducing Fashion Origami, a fabulous fusion of fresh style and timeless craft. With this book, girls learn to turn single sheets of paper into sassy fashions that are anything but flat. Super-clear, step-by-step instructions show how to fold 10 unique pieces, from party dresses and skirts to pajamas and purses. The results are cute, cool, and uniquely dimensional. Custom-designed origami paper in an array of bold and bright patterns gives each project an up-to-date look influenced by the pop appeal of Japanese fashion. The included sequins, ribbon, and glue make it easy to add your own flair. The result: tons of cute and collectible looks for a totally personalized dream wardrobe. 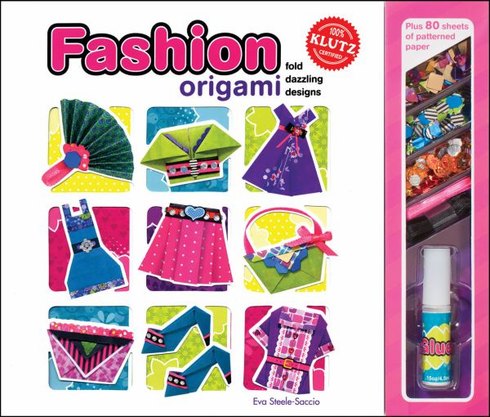 Origami has been around for thousands of years, and fashion for longer than that. Fold these two enduring obsessions together, and youÕve got a whole new dimension of fun.